That’s right, folks – this ain’t no modern homemade marshmallow trend. We’re kickin’ it old school with divinity, baby! 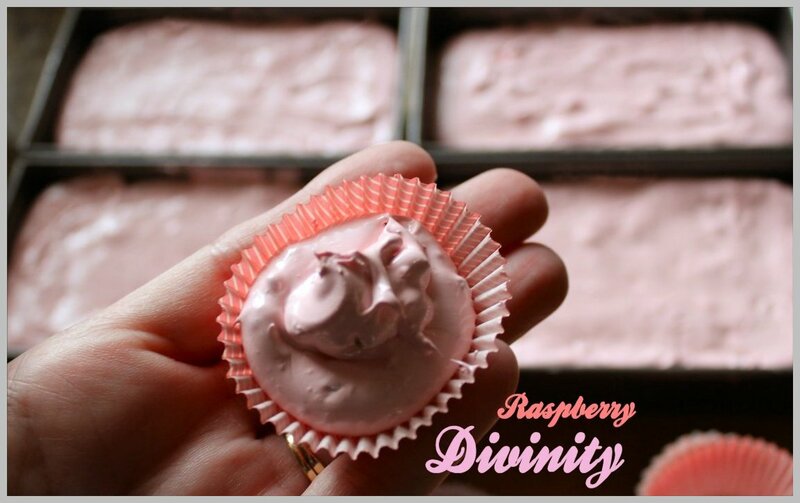 This raspberry version is sure to soothe your savage sugar craving. It’s retro. It’s fluffy. And it’s pretty in pink. Valentines’ Day may be for lovers, but let’s not forget that it’s also an excuse to celebrate SUGAR. Candy, chocolates, cupcakes, creme brulee… you name it, we’ll eat it. So join my blogging friends and I as we stop lookin’ for love in all the wrong places and start rummaging through the pantry for something sweet. 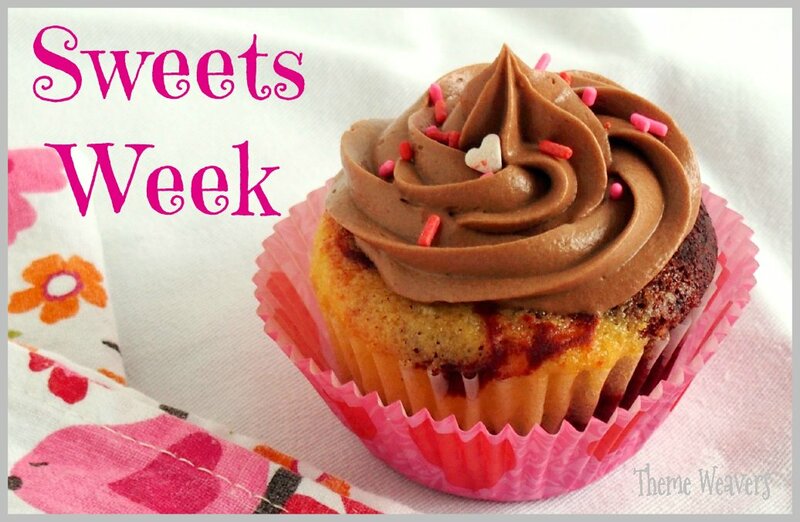 It’s Sweets Week, and we’re celebrating with sweets for your sweetie pies. When I was a kid, my mother made divinity every Christmas. I remember little balls of white fluffy confection laced with chopped pecans like it was yesterday. 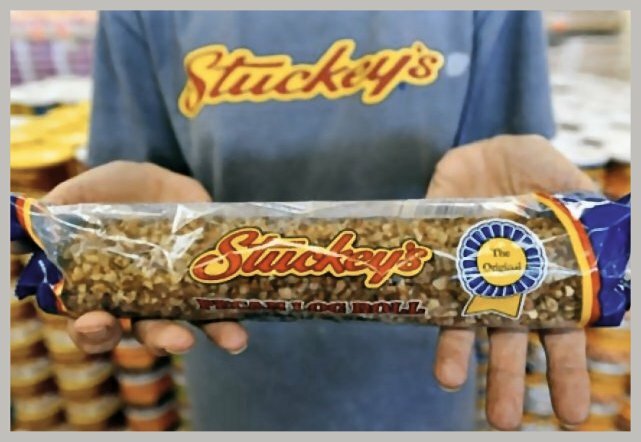 While most kids were getting their divinity fix from a Stuckey’s Pecan Log, our Mom was shaming other mothers by making it at home. Mom rocked the 70’s. But this ain’t my Mama’s divinity. This version is cooler. It’s hipper. And did I mention it’s PINK? That hue is due to yet another childhood favorite – Jello. That’s right. Good old-fashioned Jello. Raspberry to be exact, although I’ve also made this with cherry and I’m pretty sure it would rock in blackberry, too. Start by lightly oiling an 11″ x 7″ pan, or you can use 4 miniature loaf pans like me. I sprayed them with regular Pam cooking spray, then wiped them gently with a paper towel so they were lightly oiled. Next, combine the sugar, corn syrup and water in a medium or large saucepan (you’ll need 4-5″ of headroom, because this will come to a furious boil and rise in the pan). 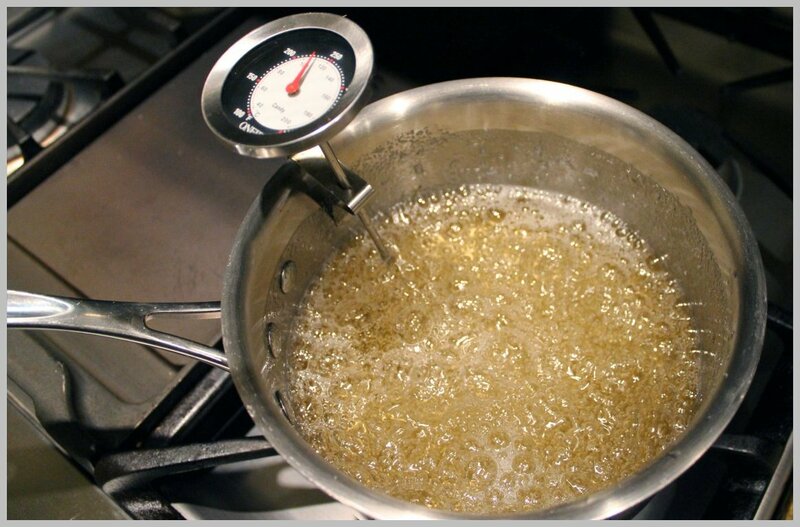 Set it over medium-high heat and whisk it occasionally until it reaches 260F on a candy thermometer. When the sugar syrup reaches around 200F, start your egg whites. 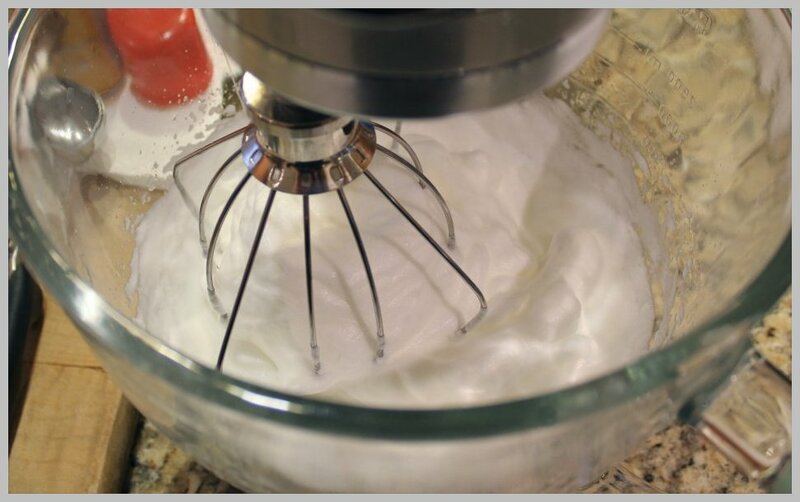 In the bowl of an electric mixer, whip your egg whites until soft peaks begin to form. 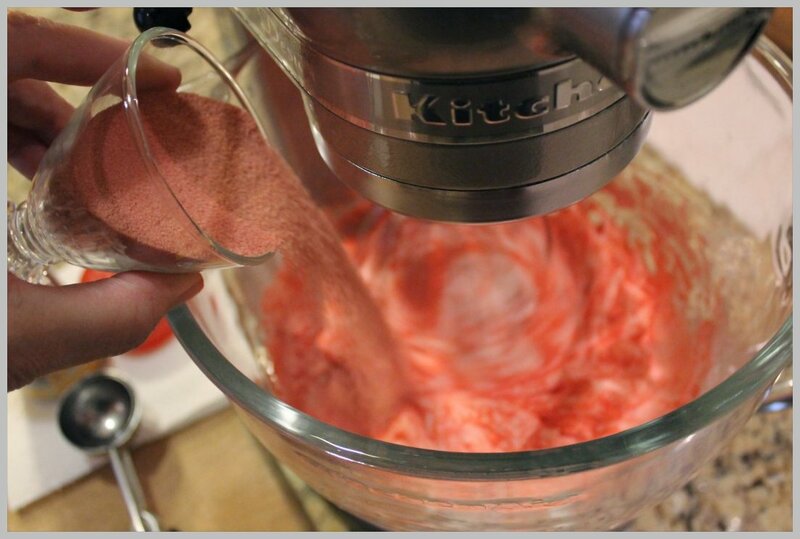 Lower the speed and sprinkle in the Jello powder, whisking until combined. Turn the speed up to high and continue to beat until the Jello powder is incorporated and the egg whites hold their peaks. 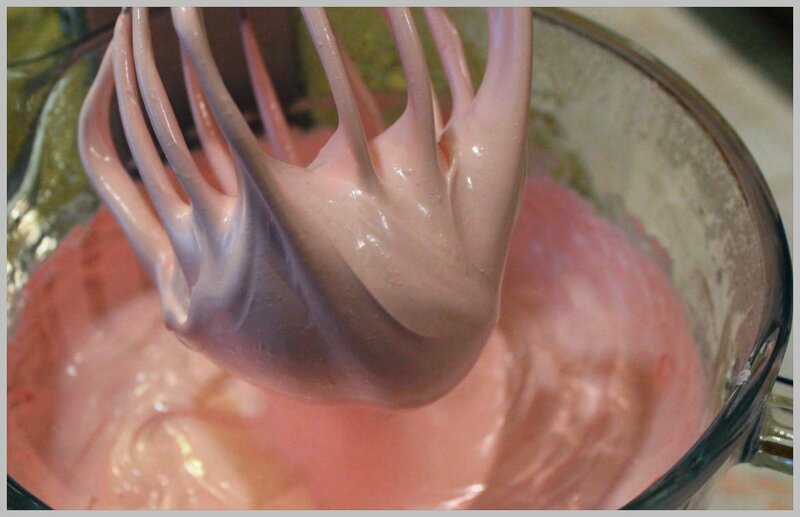 Once the syrup mixture reaches 260F, turn the mixer to medium-low and slowly pour a thin stream of syrup into the egg whites until all of the syrup has gradually been added. 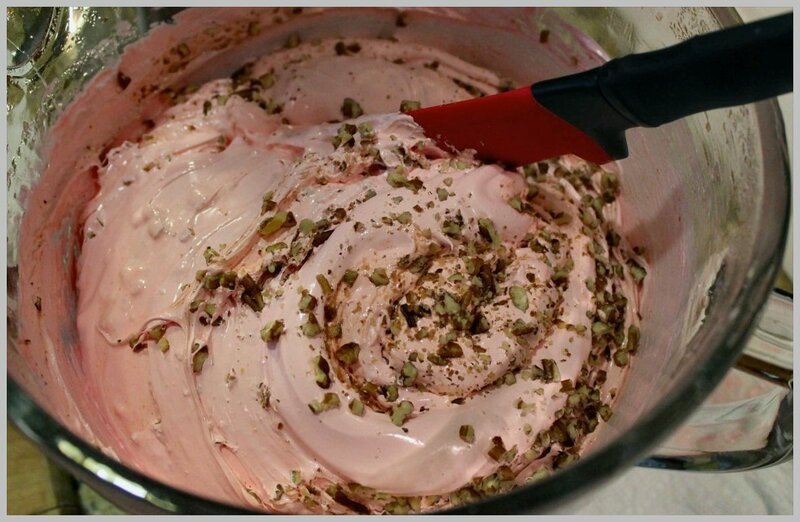 DO NOT STOP THE MIXER WHILE ADDING THE HOT SYRUP MIXTURE OR YOU WILL SCRAMBLE YOUR EGG WHITES! Sorry for the drama, but it’s a divinity no-no to stop the mixer & scramble the eggs. 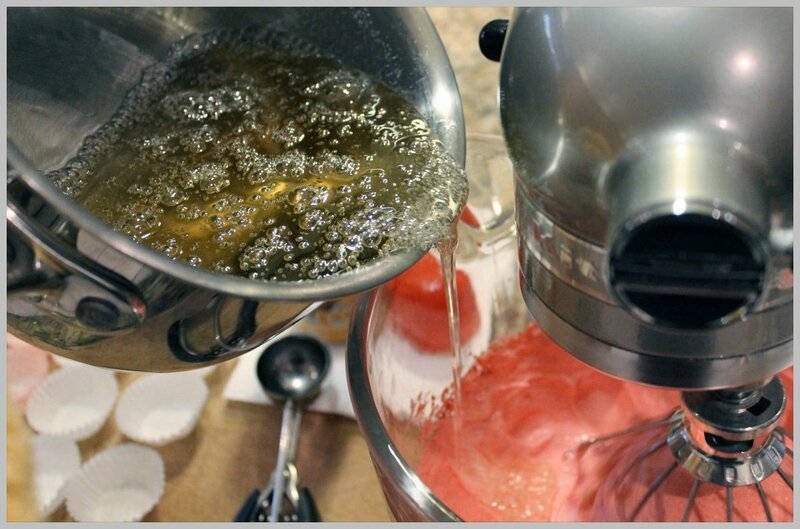 Once all of the syrup has been added, turn the mixer up to high and let it run for 6-8 minutes, or until the candy mixture begins to get very thick. I just set the timer and went for the full 8 minutes. Better safe than sorry, I always say. Turn off the mixer and remove the beater. At this point, the divinity will be thick and glossy. Using a spatula, fold in the pecans and vanilla extract by hand. Pour the candy mixture into the prepared pan(s) and smooth evenly. If yours sets up as quickly as mine did, you may need to lightly spray your spatula or hands with additional cooking spray to keep the candy from sticking to it. Now the hard part – set your pan(s) on a kitchen towel somewhere out of the way and let it sit for at least 6-8 hours to completely firm up. I put mine on our formal dining room table because we haven’t used it for a meal since 1992. 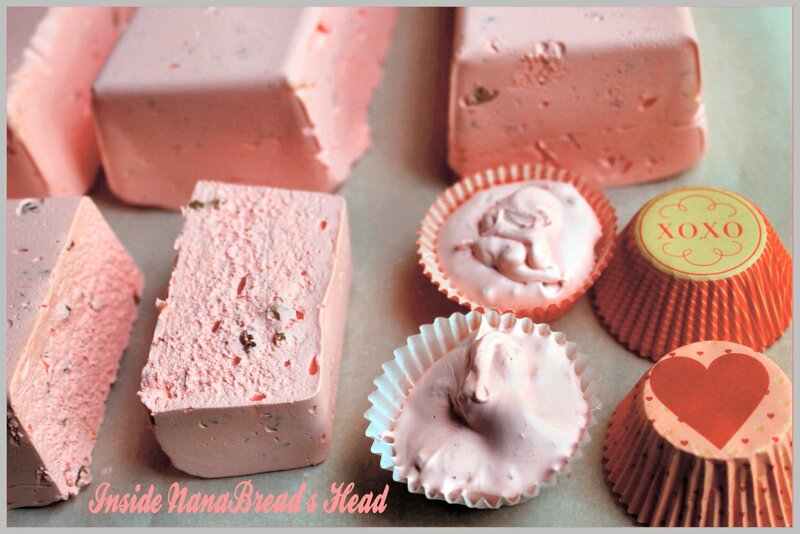 Once it’s set, cut into 1″ squares with a lightly oiled knife; a serrated bread knife works best. Store in an airtight container at room temperature. 1. Humidity and Divinity are not friends; they do not play well together. 2. Divinity should never be refrigerated; apparently it doesn’t like cold, either. 3. Most candy, divinity included, should not be made on a rainy day (see #1). 4. Unless they are ‘of a certain age’ your friends may not recognize divinity. 5. Just tell those friends you made ‘marshmallows with nuts’ – it’s simpler. 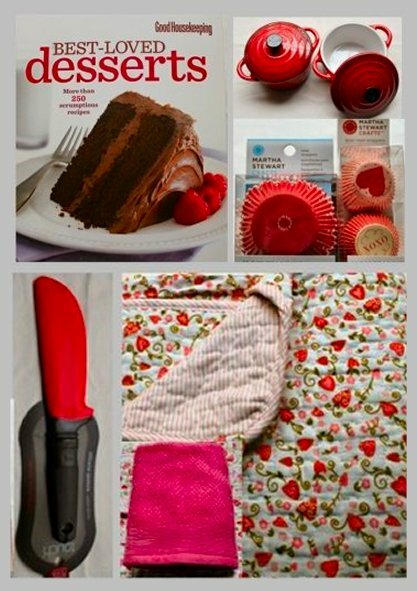 This prize package includes: one copy of the Good Housekeeping Best Loved Desserts cookbook with more than 250 glorious recipes, two adorable ceramic mini-crocks in cherry red, two packages of treat wrappers by Martha Stewart, my favorite bowl-scraping silicone spatula in Valentine’s red, a sweetheart print quilted apron, and a matching kitchen towel in raspberry. Note: My friend Katie, The Hill Country Cook, introduced me to these sweet little single-serving ceramic crocks. You’re going to love them! 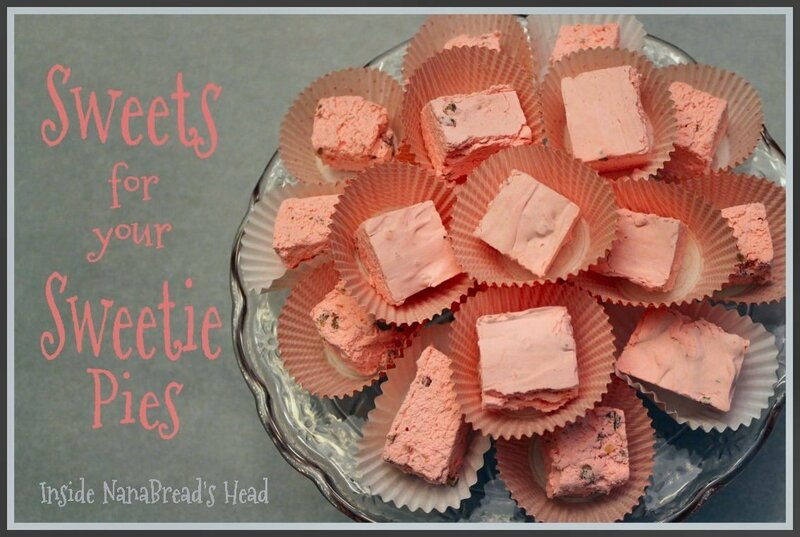 To enter, simply leave a comment at the bottom of this post telling me your favorite sweet treat. This giveaway will run from 8:00am CST on Sunday, February 10th through 12:00 Noon CST on Saturday, February 16, 2013. One winner will be selected at random and notified by e-mail. If the reader selected does not respond within 48 hours, a new winner will be drawn. Participation is limited to US residents only.